"Where do you get so much energy at 2:30 in the afternoon?" An interesting release from Audionics this time! The much talked about afternoon concert from Houston, August 28 1976. No tape, neither audience recording nor inline, has been available from this show before. Here Audionics gives us the (almost) complete concert in very good soundboard quality. A find! 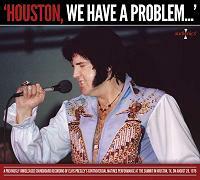 In Houston reports says that Elvis was weak as never before and had problems moving around. The review in Houston Post was also very bad. The writer says that Elvis totally broke his heart. "The concert was terrible, a depressing, silly, amateurish mess, served by a fat, stumbling and mumbling figure who didn't at all behaved himself like a "King" of Rock'n Roll". The audience was shocked; someone said "Oh, my God, what is wrong with him. He can't even complete his sentences". The reporter wrote that when Elvis wanted to say "Ladies And Gentlemen", it sounded more like "ladishandshgennimen". Tony Brown, his piano player at the moment, tells that this probably was the worst Elvis concert ever. "He was worse there than in Maryland (Sept. 1974)...It was a sorry show. And the next night...Okay again". This new soundboard supports the story that Elvis was very weak, on some songs he is way off and generally slow as a very old and tired man. Some songs, like 'Love Me' runs at almost half speed. Otherwise showstoppers like 'America' and 'Hurt' are plain awful. Elvis sound half asleep and really struggles with timing of the songs. There are no real highpoints on this show, although the reprise ending of 'America' has Elvis giving some extra...and somehow it works. 'Polk Salad Annie' is not all that bad, and it comes with an interesting solo by Jerry Scheff. Even James Burton throws in a little extra not found everytime. 'Polk Salad Annie' is a song that seems to work in all circumstances, through all years Elvis were on stage. During the introduction and while talking to fans, Elvis appear to be coherent and relaxed. He is just very sluggish, sounding drugged by sleeping pills or something in that category. However, the front row fans get a lot of attention and the feedback from the audience - as heard on this tape - is good all the way through. Just like the impression you get from the other shows during Summer 1976 and this specific tour also. There is nothing out of the ordinary here. (We have had Old Times They Are Not Forgotten, Southbound and Still Rocking The Nation!). Ronnie Tutt from Dallas get a lot of cheering from the Texas audience, which has Elvis saying; "You got your family out there". After a longer than normal blues solo from Jerry Scheff, Elvis tells him to do that "thing" ('Battle Of New Orleans theme'). This was the 5th tour Tony Brown did, but even today Elvis introduces him saying "He is new with us...". Tony had to this day in Houston already performed over 50 concerts with Elvis on tour (not counting the Lake Tahoe shows in April/May the same year)!! Yes, this really is a bad performance from Elvis, like reports tell. However, it is not severely poorer than two other Summer shows we have heard from soundboard - from previous tour - namely New Haven and Bicentennial Elvis Experience. And the show from Madison, June 24 1977 is even worse in my point of view. Judging by the sound "evidence" as found on this CD there were no reason for pointing this out as the most catastrophic show as one have been told, but then again...sound alone does not always tell the full story. Kudos again to Audionics who managed to find and release this show. It is a chapter in the Elvis history, and now we have it on tape!